Is California youngster the reincarnation of Bobby Jones? 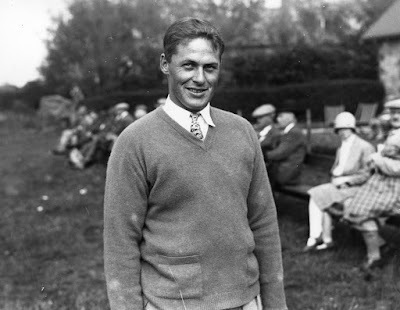 3-year-old golfing prodigy sees photo of Jones, says "This me"
As the club and tournament that is the legendary Bobby Jones’ legacy to the game celebrates youngsters playing golf, a recent book details the story of a California youngster who has claimed to be Jones’ reincarnation. In his book, Return to Life: Extraordinary Cases of Children Who Remember Past Lives Dr. Jim B. Tucker presents the case of Hunter (not his real name), a 3-year-old boy who identified himself with a photograph of Bobby Jones and selected a photograph of Jones’ childhood home as his. The child had gone on to win 41 of 50 junior tournaments by the time he was 7, including 21 in a row. Tucker is an associate professor of psychiatry and neurobehavioral sciences and the director of the division of perceptual studies at the University of Virginia. Founded in 1967 by Dr. Ian Stevenson, the division has developed a scientific approach to studying reincarnation. Tucker, who studied with Stevenson, makes the case that “this phenomenon, beyond being consistent with scientific knowledge, can even lead to new insights about the true nature of reality, both about our existence in this world and about the possibility of life after death.” Read more at Is California youngster the reincarnation of Bobby Jones? Q: I've heard that spirits do a lot of masquerading, so how do we know for certain who we are contacting? -- Paula M.
A: Ascertaining the identity of a communciator from the Other Side or spirit realm can be tricky at times. The dead often provide factual information that is known to the living, or which can be checked out and validated. Sometimes they do not, for a variety of reasons--often the exchanges are too short. They may give no name or only a first name, and insufficient details about their lives on Earth. Spirits also have their bona fides, and major ones are identifiable by names, appearances, behavior patterns, and energy that can be sensed psychically. In some cases, trickster spirits will masquerade as the human dead, even assuming personalities known to the living. They are capable of fooling people, but only for a time--sooner or later, they give themselves away and their true identity comes out. Countless communicators encountered in the course of paranormal investigations and other forms of contact are harder to pin down. They may not offer enough information for proper validation. They fall into the "unknown" or "unexplained" categories. We on the other end have to make decisions about what we will accept at face value. Individuals who become experienced in spirit communications develop their own innate sense of what sounds true and what is suspect. It's an inexact art, however. Ultimately, we have no way of proving many identities beyond the shadow of a doubt.